"I really like the idea of being able to learn a game as well as have fun with the game at the same time." 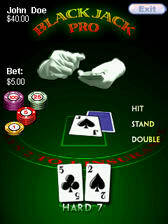 "Black Jack Pro is a very slick Black Jack simulator. I call it a simulator instead of game because they really pay attention to detail! The 22-page PDF manual has enough rules on Black Jack to make you a pro..."
"...this is a great game!" "Companies like G3 Studio are really redefining the level of games available for Pocket PC." "If this is any indication of what is to come from G3 Studios, then I feel like we are going to be in for some great games. G3 Studios has taken the time to go from a relatively simple game like Black Jack, and made it into a great, fully animated Pocket PC application that well surpasses other Black Jack games that are out there for and PDA." "In my opinion the best Black Jack simulation for the Pocket PC to date." "Black Jack Pro is the best black jack game for a PDA that I have ever played." "Black Jack Pro has the best graphics and sounds of any card game I have played..."
"...the PC version does a journeyman's work in bringing the casino to a small window on your desktop." "...a highly polished and very well presented title!" "If Black Jack is your game, I doubt there is anything out there that comes close to the presentation on offer here."